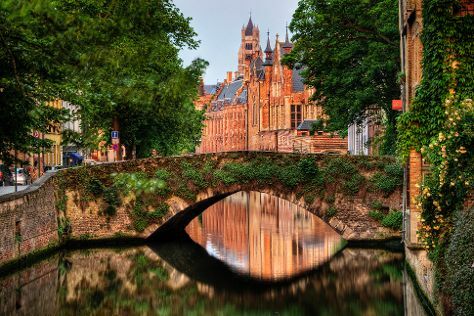 On the 3rd (Wed), examine the collection at Choco-Story - The Chocolate Museum, then steep yourself in history at Historic Centre of Brugge, then contemplate in the serene atmosphere at Basilica of the Holy Blood, and finally make a trip to The Markt. On your second day here, contemplate the waterfront views at Minnewater Lake, admire the masterpieces at Groeningemuseum, then look for gifts at Carpentier-Goegebeuer, then take in panoramic vistas at Belfry of Bruges, and finally indulge your thirst for a good beer at Huisbrouwerij De Halve Maan. To find where to stay, other places to visit, ratings, and other tourist information, refer to the Bruges custom trip planner. Washington DC, USA to Bruges is an approximately 18-hour flight. You'll lose 6 hours traveling from Washington DC to Bruges due to the time zone difference. Plan for a bit cooler temperatures traveling from Washington DC in May, with highs in Bruges at 60°F and lows at 46°F. Finish up your sightseeing early on the 4th (Thu) so you can go by car to Brussels. On the 5th (Fri), see the interesting displays at Musical Instruments Museum, then steep yourself in history at Grand Place, then examine the collection at Horta Museum (Musee Horta), and finally see the interesting displays at Manneken Pis. For photos, other places to visit, more things to do, and more tourist information, go to the Brussels online itinerary creator. Drive from Bruges to Brussels in 1.5 hours. Alternatively, you can take a train. Expect a daytime high around 64°F in May, and nighttime lows around 48°F. Wrap up your sightseeing by early afternoon on the 6th (Sat) to allow time for travel back home.